I’m at the library in bike crazy Cumberland BC. I had not been off-island (Cortes, that is) for months. So in defiance of the Weather Forecast (pooh i say!) i leapt abike and pedaled off and away, cross island and through Campbell River and beyond. After 30 flat but boring kms on the old Island Highway I coasted through Courtney where every lamp post on Main St. plays happy ’60’s tunes (creepy as hell), then detoured along rural Headquarters Road where i stopped to fill my belly with blue plums and apples, and put my feet up the plum tree for a rest. Arrived in Cumberland after 75 or so km to check myself in to the Riding Fool Hostel for a couple of days of luxury vacation. 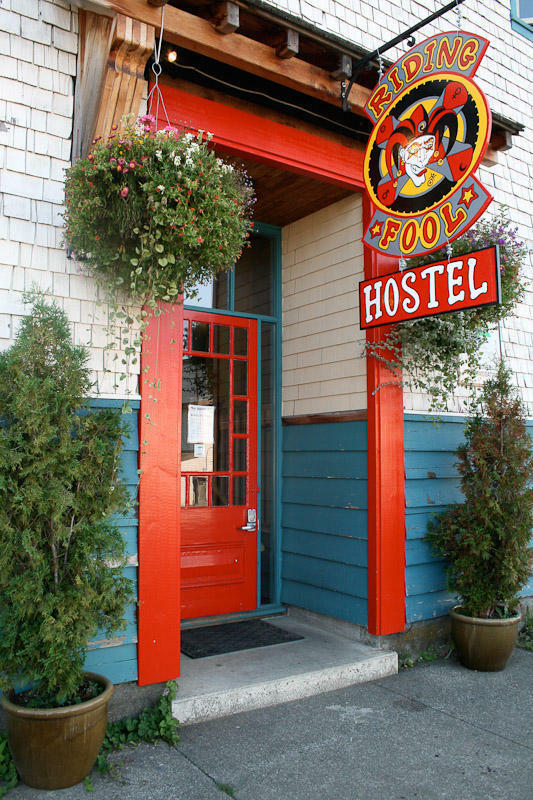 When I pulled up at the Fool a crowd of women on mountain bikes was amassed outside the door. I asked someone if they were checking in and she said, no, just going for a ride. That was my first clue. Cumberland is a bike-mad town – who knew?! Trail riding is the big deal here and mountain bikes are EVERYWHERE, a local obsession. Every shop is decked in bike art and paraphernalia, and the streets are lined with Rotary Club-sponsored bike posts. The little community forest boasts a network of trails and it seems like everyone is headed to or from there, all decked out in shiny jerseys and body armour with camelback hoses plugged into their faces. My grumpy side sees way too many big trucks and SUVs, all decked out with fancy bike racks – can they really be driving so far, to ride, in Cumberland? I want to point out to them that the handy thing about bikes is, they have wheels. But i don’t. I get a grip, order a latte at Tarbell’s, and sit back to enjoy the rampant bike culture. Because really it isn’t just sport, and the bike consciousness might start with a shiny toy but it leaks right into the lifestyle. There are cruisers and 10-speeds and commuter hybrids and trail-a-bikes, none of them locked. Every child big enough to walk is on a run bike. Adults who can’t walk are on hand-pedaled recumbents. And the kids ride, to school – hallelujah! I watched a little guy on a scooter coast solo down the main drag to the crosswalk, where a massive 18-wheeler stopped to let him cross. The kid confidently raised his hand and waved the truck through, then continued across to school. Now THAT is the way it should be. In an hour or so i will climb abike and head home to my little island, cheating just a bit -Â gonna catch the bus (for $2) from Oyster River back to Campbell River, and save myself 20km of sucking tailpipe on the highway. And the sun, is shining.